The uppermost Maastrichtian and lowermost Paleocene rocks in the Williston Basin of western North Dakota, northwestern South Dakota, and eastern Montana contain the best exposed and most studied nonmarine record of the terminal Cretaceous event in the world. This region contains 41 (39%) of the known terrestrial K-T boundary sections (see Table 2.1 and Appendix). The Williston Basin is a large structural depression occupying much of North Dakota and parts of South Dakota, Montana (Figure 6.1), and it extends into southern Saskatchewan. The stratigraphic units in which the K-T boundary is preserved are the Hell Creek Formation, which for the most part is Maastrichtian in age, and the Fort Union Formation, which for the most part is Paleocene in age (Figure 6.2). The Hell Creek Formation is composed of fluvial sandstone, mud-stone, and claystone. It includes rare, thin lignite beds and minor marine units. It was deposited at the edge of the Western Interior seaway (Roberts and Kirschbaum 1995, Johnson et al. 2002). The Fort Union Formation is composed of extensive lignite and carbonaceous shale beds, variegated mudstone of lacustrine origin, and sandstone largely of crevasse-splay origin. The facies change that marks the formational contact was caused by rising sea level during a temporary re-advance of the Western Interior seaway in early Paleocene time known as the Cannonball Sea, a Paleocene remnant of the Cretaceous seaway represented by the Cannonball Member of the Fort Union Formation (Figure 6.2). The K-T boundary is stratigraphically near (0-3 m), and in some places precisely coincident with, the Hell Creek-Fort Union formational contact. Figure 6.1 Outline map of the Williston Basin in western North Dakota, eastern Montana, and northwestern South Dakota and the Powder River Basin in southeastern Montana and northeastern Wyoming. 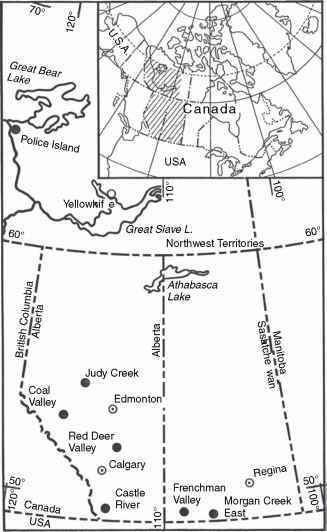 The northernmost part of the Williston Basin extends into adjacent southern Canada. 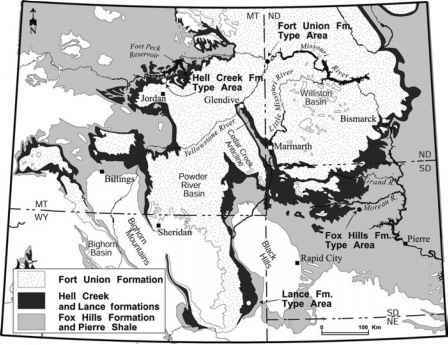 Williston Basin margin is defined by the Hell Creek-Fort Union Formation contact and Powder River Basin margin is defined by the Lance-Fort Union Formation contact. These formation contacts approximate the K-T boundary (from Johnson et al. 2002). Reprinted by permission. to excellent as the climate of the central Great Plains is arid and the soft bedrock weathers to form extensive but discontinuous areas of badlands dissected by tributaries of the Missouri River (Figure 6.3). The Williston Basin is dinosaur country, from which the first known skeleton of Tyrannosaurus rex came in 1905 and where, 85 years later, perhaps the most famous T. rex, "Sue," was discovered. The region has yielded numerous skeletons of Triceratops horridus now on display in natural history museums around the world, and it is from this region that most of the iconography of vertebrate extinction at the K-T boundary has emerged. See Russell and Manabe (2002) and references therein for more about the dinosaur fauna of the Hell Creek Formation.